Before or after your cruise, see the beautiful and famous sights of Los Angeles on a deluxe airplane tour with Champagne! Enjoy unforgettable views of Marina del Ray, Manhattan Beach, the Getty Center, downtown Los Angeles, the Hollywood sign and more. Whether you are preparing to board your cruise or just disembarking from it, don’t miss this chance to see Los Angeles from the air on a deluxe Champagne airplane tour! This pre- or post-cruise shore excursion is the best way to see this sprawling, ocean-side city. Begin your tour by propelling over Long Beach and LA's harbor. Fly around the Palos Verdes Peninsula, up through the beach cities of Hermosa, Redondo, Manhattan and Marina Del Rey, and over to the Santa Monica Mountains. Then soar over the Getty Center, Brentwood, Pacific Palisades and some of the celebrity homes in Beverly Hills! Finally, fly over the Hollywood Hills, Universal Studios, Dodger Stadium and the downtown skyscrapers before heading back to the landing strip. 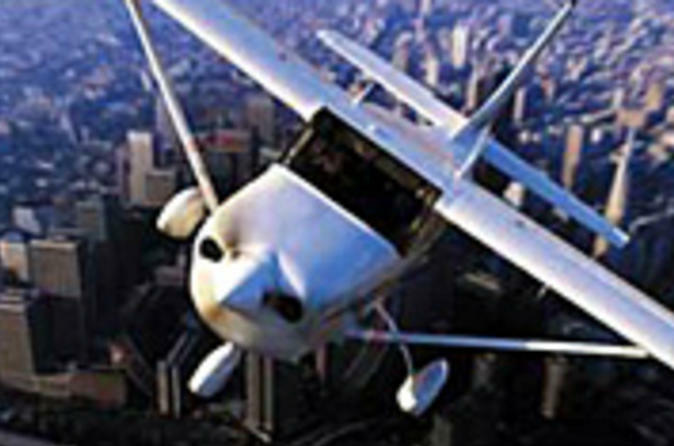 This deluxe air tour is one of the most popular airplane experiences in LA and offers the chance to discover the city while you enjoy a bottle of Champagne. We will ensure your timely return to the Port of Los Angeles for this activity. In the rare event your ship has departed, we will arrange for transportation to the next port-of-call. If your ship is delayed and you are unable to attend this activity, your money will be refunded. See our terms and conditions for full details. Please note: The listed price does not include a $10 per person fuel surcharge, payable at the time of tour check-in. The fuel surcharge is required by our local supplier and is not within our control.